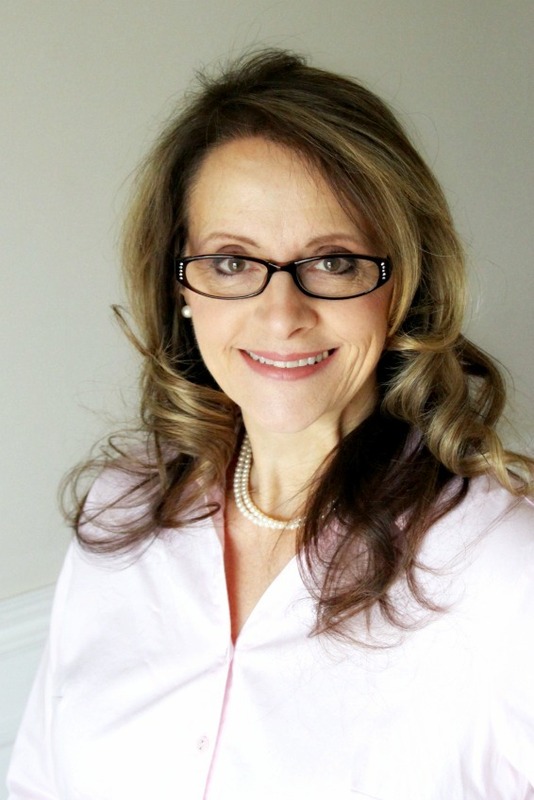 It’s an Improv Challenge again with Kristen @Frugal Antics of a Harried Homemaker. The theme this time… carrots and ginger! I tossed in a few other ingredients and came up with a moist and hearty Carrot, Currant & Coconut Muffins with Cream Cheese Frosting. It is filled with lots of goodies. 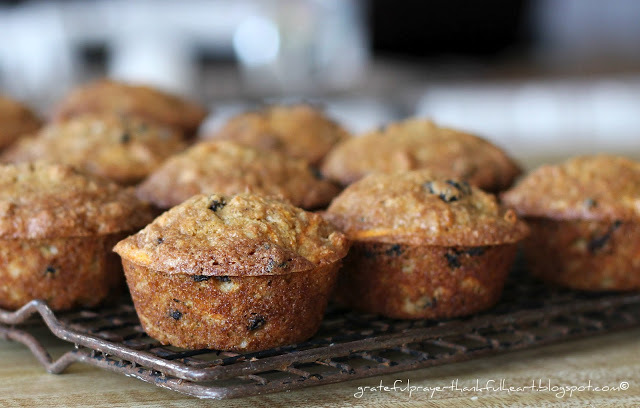 After considering all of the nutritious ingredients in this recipe, I made a second batch with the goal of making the muffins a bit more healthy. I reducing the fat by substituting applesauce/oil for the butter and adding whole wheat flour for part of the white flour. You could take this further by using egg substitute and/or using honey for part of the sugar. I haven’t baked with Splenda but that might also be a possibility. The whole wheat taste is noticeable in the lighter version but it is still moist and even got a better crown than the higher calorie muffin. And, it got a thumbs-up from my finicky, five-year-old taste-tester and that’s saying a lot! I prefer the first recipe. But then, I personally, would rather have just one bite of something wonderful than a bigger piece of something not as wonderful. The healthier recipe substitutions are in parenthesis. Preheat the oven to 350F. Spray 12-cup muffin pan. In a large bowl, combine the eggs, cooled butter, and vanilla. Beat with a whisk until smooth. In another bowl, whisk together the flour, sugar, cinnamon, ginger, salt, baking powder and baking soda. Stir the flour mixture into the egg mixture just until combined. Fold in the carrots, currants, coconut and walnuts. Spoon batter into muffin cups, filling three-fourths full. Bake 20-25 minutes or until toothpick inserted in center comes out clean. Let stand for a few minutes; remove from pan to rack; cool completely. Serve as is, sprinkle with confectioners sugar or add Cream Cheese Frosting. Store frosted muffins in refrigerator. Combine all ingredients in a small bowl and stir vigorously until smooth and spreadable. Healthier version made with part applesauce and part whole wheat flour. OMG, these flavors sounds so good, and they are healthy, what more could one want. Thanks for sharing your creative inspirations over at Sunday's Best. I feel so bad that you didn't get added to the collection! I never received an email from you telling me about your post. Your muffins sound wonderful, and as always, your photos just about knock my socks off. You have such a talent! Thanks for your kind words on my weblog. On your weblog I find delicious recipes. I will sure take some time to look at them and maybe try some. I think this looks as good as it gets! Lorraine, you get a thumbs up from me, too. Both look delicious. I've got a bag of carrots that are supposed to go to the juicer tomorrow, but you are tempting me! Hugs and happy wishes, my friend. Yummy! 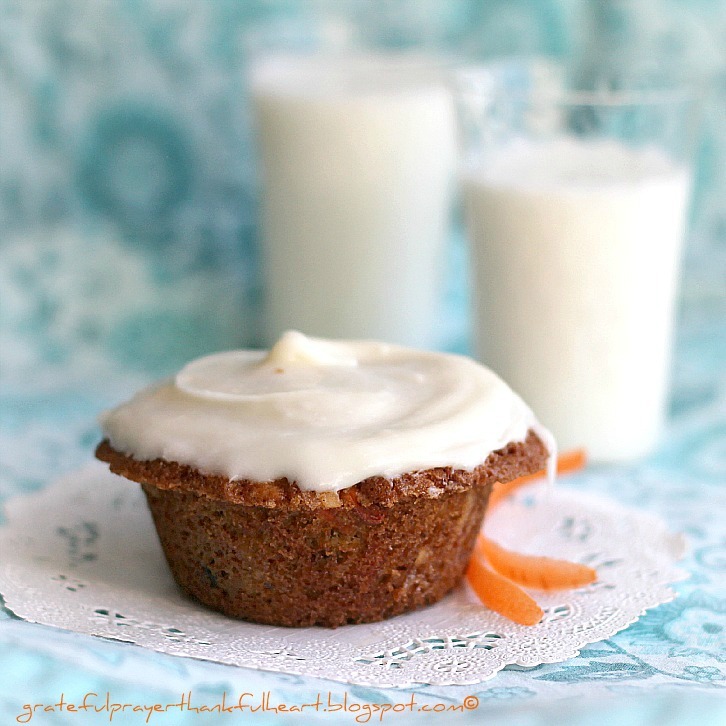 I like baking with carrots and these muffins look just wonderful. Thank you for sharing the recipe. P.S. I'm doing much better. Thanks. I love these flavors. Thanks for sharing. Your pics are stunning. I would love for you to share at Bacon Time's weekly Friday to Monday linky. While I, too, believe in healthy eating, I also believe that it is important to enjoy a treat now and again. You're right – one fabulous bite is more my preference than a whole slice of so-so. I love currants but find so few recipes that use them. Thanks! 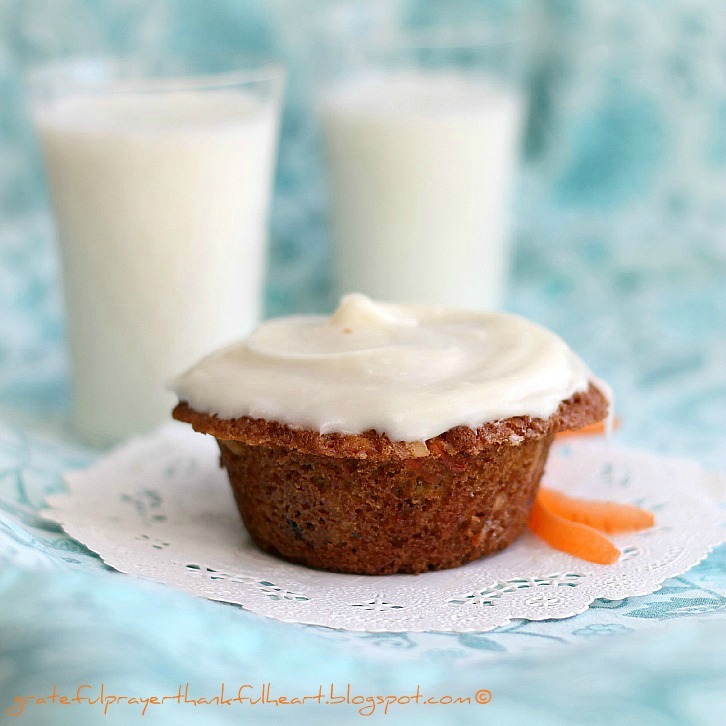 I love carrot cake, and I'm sure these are even better! Thank you so much for the healthier version. Pinning this! Your photo is absolutely stunning – and the muffins sound utterly divine. You share the best recipes! This one looks so good too. I have been pinning some of them on Pinterest with links back to you. I am so hungry just looking at your photos. Hope you guys have a nice weekend. Those muffins look so yummy! Sounds delish and your photos are soooo beautiful! Amazing what wonderful ways there are to serve up carrots and ginger. Lovely looking muffins, I think I even like the healthy looking ones best! These look delish! All I need is a tall glass of milk and I would be good to go! you always make the tastiest looking treats. These look really good! Have you ever baked with "coconut flour"?! It is wonderful! Talk about good nutrition! You have a lovely place here. You pictures (and muffins) are stunning! Oh my, thank you so much for the recipe! Your muffins look scrumptious!!! These do look scrump-dittley-isous and so are the photos. I keep all these ingredients on hand to something I just may try this weekend from breakfast.